A microtiter plate was coated overnight with various antigens at a concentration of 5 μg/ml. After washing and blocking with PBST + 5% BSA, detection was performed using Human Anti-Eculizumab Antibody, clone AbD32311 (HCA312) at a concentration of 2 μg/ml and an HRP conjugated anti-DYKDDDDK tag antibody in HISPEC Assay Diluent (BUF049A) followed by QuantaBlu Fluorogenic Peroxidase Substrate. 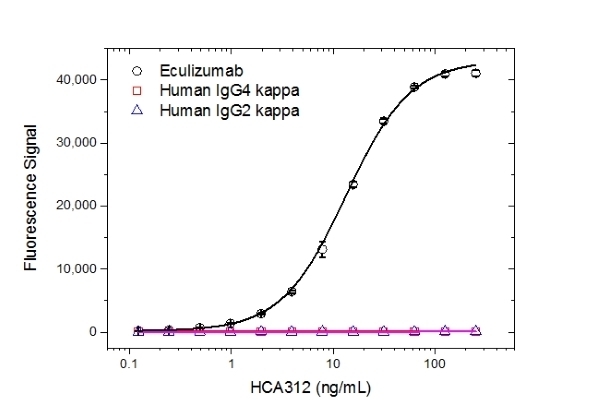 A microtiter plate was coated overnight with eculizumab, human IgG4 kappa or human IgG2 kappa at a concentration of 5 μg/ml. After washing and blocking with PBST + 5% BSA, detection was performed using Human Anti-Eculizumab Antibody, clone AbD32311 (HCA312) titrated to the given concentrations in PBST, followed by detection with Mouse Anti-Penta Histidine Tag:HRP Antibody (MCA5995P) in HISPEC Assay Diluent (BUF049A) and QuantaBlu Fluorogenic Peroxidase Substrate. 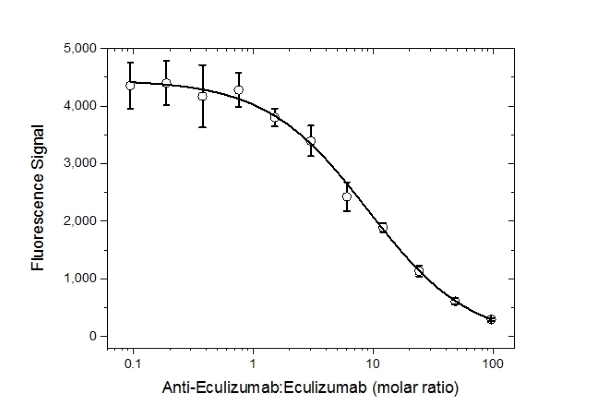 Data for eculizumab are shown as the mean of three measurements. A microtiter plate was coated overnight with Human Anti-Eculizumab Antibody clone AbD32311 (HCA312) at a concentration of 1 μg/ml. After washing and blocking with PBST + 5% BSA, 10% fetal calf serum was added spiked with increasing concentrations of eculizumab. Detection was performed using HRP conjugated Human Anti-Eculizumab Antibody clone AbD32107_hIgG1 (HCA313P) at a concentration of 2 μg/ml in HISPEC Assay Diluent (BUF049A) and QuantaBlu Fluorogenic Peroxidase Substrate. Data are shown as the mean of three measurements. A microtiter plate was coated overnight with human complement C5 at a concentration of 1 μg/ml. After washing and blocking with PBST + 5% BSA, a pre-incubated mixture of eculizumab (0.3 μg/ml), spiked with increasing concentrations of Human Anti-Eculizumab Antibody, clone AbD32311 (HCA312) was added. Free eculizumab still capable of binding to the human complement C5 coated plate, was detected using Mouse Anti-Human IgG (Fc) CH2 Domain:HRP Antibody (MCA647P) followed by QuantaBlu Fluorogenic Peroxidase Substrate. Data are shown as the mean of three measurements. Human Anti-Eculizumab Antibody is a recombinant, inhibitory anti-idiotypic antibody in monovalent Fab format; it is recommended as capture antibody in a PK bridging ELISA format with HCA313P for detection. Human Anti-Eculizumab Antibody, clone AbD32311 is a paratope specific, inhibitory anti-idiotypic antibody that specifically recognizes the free humanized monoclonal antibody eculizumab. 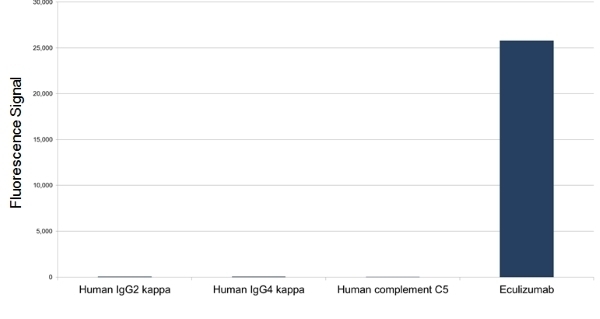 It does not recognize free human complement C5 or eculizumab in complex with C5. 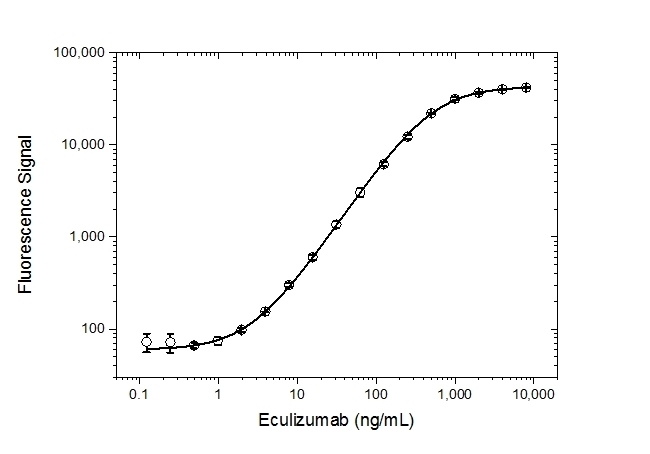 The antibody can be used to measure free eculizumab or eculizumab biosimilars in patient samples. A pair of anti-eculizumab antibodies can be used to develop a pharmacokinetic (PK) bridging assay to measure free drug. This antibody, in monovalent Fab format, is recommended as the capture antibody, paired with an HRP conjugated Anti-Eculizumab Antibody in full immunoglobulin format, clone AbD32107_hIgG1 (HCA313P) as the detection antibody. A monovalent human recombinant Fab (kappa light chain) selected from the HuCAL® phage display library, expressed in a human cell line. The antibody is tagged with a DYKDDDDK tag and a HIS-tag (HHHHHH). This antibody is supplied as a liquid. Clone AbD32311 can be used in an indirect ELISA or as the capture antibody for eculizumab in a bridging ELISA together with HCA313P as the detection reagent.